The Egyptian Community Council are one of more than 100 stalls taking part in Auckland International Cultural Festival on Sunday 8 April in celebration of Auckland’s rich cultural diversity. 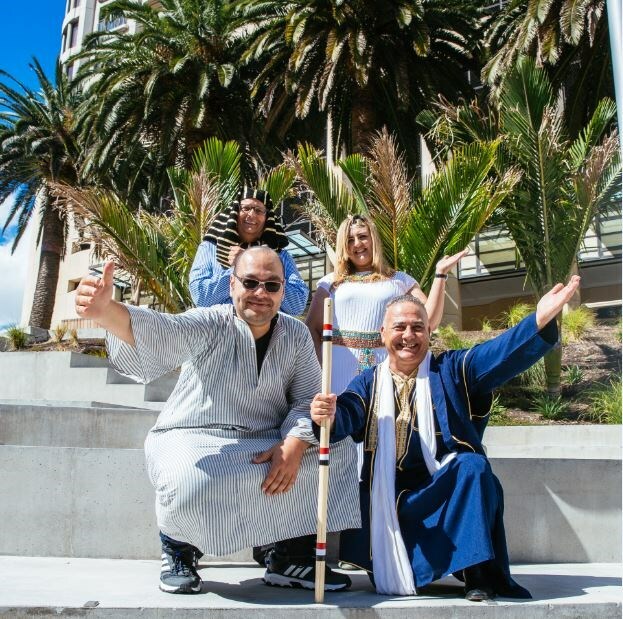 The Egyptian Community Council brings together the Egyptian community in New Zealand, offering support, social activities and a chance to share their culture and history. We spoke to the group’s deputy president Aiman Grace about Egyptian culture and the fascinating artefacts, tasty foods and traditional dances that they will be showcasing at the festival. What can we look forward to at the Egyptian Community Council stall? We will be sharing our culture in many different ways! We have an amazing collection of Egyptian artefacts for festival visitors to explore, from tapestries and statues to jewellery and papyrus scrolls. Of course there’s also the food – our native food is called ‘balady,’ literally meaning ‘native food.’ There are way too many delicious flavours to describe here so people will just have to come and taste them for themselves! We’ll also be performing traditional Egyptian dances. A great one to look out for is the Tahteeb stick dance. Tahteeb started out as a form of martial arts in ancient Egypt and over time it’s become a game played at festivals and celebrations, involving two adversaries wielding sticks but avoiding striking each other. UNESCO listed Tahbteeb as a prominent Intangible Cultural Heritage of Humanity. What’s your favourite thing about Egypt? Egypt is right in the heart of the old world, in the cradle of civilisation. It was influenced and has influenced so many cultures – Persian, Jewish, Phoenician, Babylonian, Greek, Roman, Arab, Byzantine, Ottoman, French, British and more. We’re so excited to be sharing the heritage of our homeland with our new home in New Zealand. How do you celebrate your culture in Auckland? We celebrate our culture in every moment and every day. We gather with close friends and the community to celebrate Ramadan and Easter (Easter Monday is originally linked to an Egyptian celebration). We share our culture with our friends, neighbours, at our work place, at the kids’ schools, in every interaction. And finally, what do you love about Auckland? I’ve been living in New Zealand for 12 years now, it’s home to me and we love the kiwi lifestyle. I love how much there is to get involved in – scouts, beekeeping, clubs, teaching. I enjoy every day of living in Auckland and our friends here. Discover over 50 cultures at Auckland International Cultural Festival on Sunday 8 April, 10am-5pm at Mt Roskill War Memorial Park. Check out this video to find out more about the Egyptian Community Council.